Department of skin, Venereal diseases and Leprosy, Hind Institute of Medical Sciences, Safedabad, Barabanki, U.P., India. A 36-year-old female presented with cone-shaped skin lesions on the scalp and retro-auricular area of 7 months' duration. 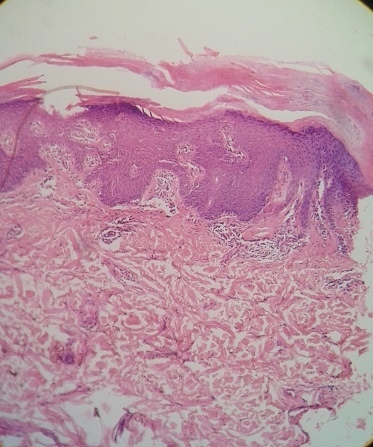 Histopathological findings showed dense inflammatory cell infiltration and remarkable Munro's microabscesses in the horny layer in addition to psoriasiform epidermal hyperplasia, and predominant dermal edema. Based on clinicopathological findings, a diagnosis of psoriasis rupioides capitis was made. She was initially treated with oral methotrexate 15 mg weekly and topical clobetasol-salisylic acid ointment and coal tar ointment for three months with no response. Then she was put on acitretin 25 mg oral daily on which she was improved. Rupioid psoriasis is characterized by very thick rock like convex lesions. It is also called ostraceous psoriasis. It is relatively resistant to topical treatment due to thick scaly barrier which prevents the absorption of topical drugs. Rupioid psoriasis is associated with chronic plaque psoriasis or psoriatic arthropathy in most of the reported cases. I am presenting an isolated case of psoriasis rupiodes capitis which responded to oral acitretin. 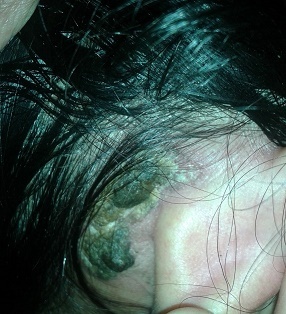 A 36-year-old female presented with limpet-like, cone shaped skin lesions with mild erythema on the scalp and retro-auricular area for the last 7 months. On history, she developed a small pea size red scaly nodule on scalp which later on enlarged and became hard. There was no history of joint pains, burning micturation or orogenital ulceration. There was also no history of photo-aggravation of the lesions or photosensitivity. On examination, the lesions were present on the scalp and retro-auricular area. 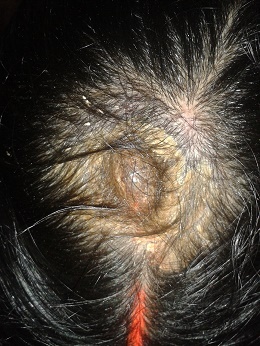 The lesion on the scalp was about 5cm in size, oval in shape with convex surface and yellow in color. The lesions of retro-auricular area were two to three in number on each side and their sizes varied from 1-2 cm. All the lesions were rock hard and non-tender. There was no cervical lymphadenopathy and nails were normal. On blood investigations, all the parameters were normal including the ESR, C-reactive protein and RA factor. The serological tests for syphilis, HIV and Hepatitis B were negative. Urine examination was normal. KOH mount of plucked hair and scrapings of lesions was done and was negative and culture for fungal elements was negative. Incisional biopsy was done from the margin of the lesion on the scalp which showed psoriasiform epidermal hyperplasia with marked Munro's microabscesses in the horny layer and in the dermis, dense inflammatory cell infiltration and no granuloma or malignant cells. 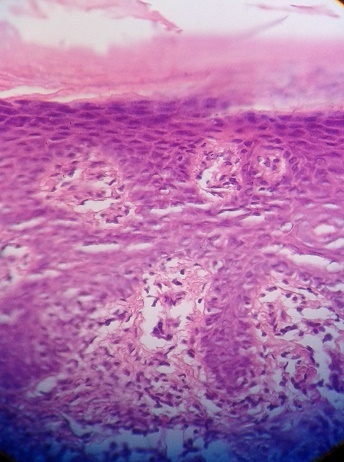 Fig 4: Histopathology (40X view-H&E stain) of scalp lesion showing Munro's microabscesses. Overall, on the basis of the clinical and histological findings the diagnosis of psoriasis rupioides capitis was made. She was initially put on oral methotrexate 15mg weekly and topical clobetasol-salisylic acid ointment for three months under occlusion and coal tar ointment at night, but no improvement was seen. Then she was shifted to oral acitretin 25 mg daily and improvement started in the form of reduction in size of the lesions over 2 weeks. Psoriasis is a common inflammatory disease of the skin and joints. It's cause remains unknown; however, it has been linked to complex interactions between predisposing genes and the environment. The pathophysiology of psoriasis is characterized by epidermal hyper-proliferation, enhanced antigen presentation, helper T cell (Th1) and Th17 cytokine production, T cell expansion and angiogenesis. Only a few cases have been reported involving a rare variant of rupioid psoriasis with cone-shaped, limpet-like lesions. [2,3,4,5] Rupioid skin lesions have also been observed in Reiter's disease and secondary syphilis. [6,7] Although the pathogenesis of rupioid lesions remains unclear, the aberrant keratinization in combination with the inflammatory process followed by the voluminous sero-exudate is likely to create the hard rupioid lesions. The concept behind using the acitretin in rupioid psoriasis is that acitretin normalizes epidermal cell proliferation, differentiation and cornification. [9,10] It is thought to exert these effects by interfering with the expression of epidermal growth factor genes. Acitretin is licensed for use in severe extensive psoriasis which is resistant to other forms of therapy, including topical, light and systemic. My special thanks to Dr. Rashmi Gupta consultant "PEARL- THE SKIN & COSMETIC CLINIC" for her support in manuscript preperation. 1. Gupta SK, Singh KK, Lalit M. Comparative therapeutic evaluation of different topicals and narrow band ultraviolet B therapy combined with systemic methotrexate in the treatment of palmoplantar psoriasis. Indian J Dermatol 2011;56:157-62. 2. Camp RDR. Psoriasis. In: Rook A, Wilkinson DS, Ebling FJG, eds. Textbook of Dermatology, 5th edn, Vol 3. Oxford: Blackwell Science Ltd, 1992: 1391-457. 3. Cvejic S, Milakov J. Psoriasis rupioides et verrucosa. Med Pregled 1967; 20: 67-179. 4. Golousenko II, Fadeeva VI, Omran A. Case of psoriasis rupioides with arthropathy. Vestnik Dermatologii I Venereologii 1984; 3: 74-5. 5. Wang J-L, Yang T-H. Rupioid psoriasis associated with arthropathy. J Dermatol 1997; 24: 46-9. 6. Sehgal VN, Koranne RV, Shyam PAL. Unusual manifestations of Reiter's disease in a child. Dermatologia 1985; 170: 77-99. 7. Held JE, Ross M, Beltrani V Jr. et al. Noduloulcerative or `malignant' syphilis occurring in an otherwise healthy woman: Report and review of dramatic dermatosis. Cutis 1990; 45: 119-22. 8. T. Murakami, M. Ohtsuki and H. Nakagawa. Rupioid psoriasis with arthropathy. Clinical and Experimental Dermatology, 2000; 25(5): 409-12. 9. Tong PS, Horowitz NN, Wheeler LA. Trans retinoic acid enhances the growth response of epidermal keratinocytes to epidermal growth factor and transforming growth factor beta. J Invest Dermatol 1990; 94: 126-31. 10. Zheng ZS, Polakowska R, Johnson A et al. Transcriptional control of epidermal growth factor receptor by retinoic acid. Cell Growth Differ 1992; 3: 225-32.